© Dmitrienko et al. ; Licensee Bentham Open. A new discrete neural networks adaptive resonance theory (ART), which allows solving problems with multiple solutions, is developed. New algorithms neural networks teaching ART to prevent degradation and reproduction classes at training noisy input data is developed. Proposed learning algorithms discrete ART networks, allowing obtaining different classification methods of input. Keywords: Degradation of breeding classes, learning algorithms, neural network adaptive resonance theory, problems with multiple solutions.. The human brain processes information flows continuously from the external environment. However, it can modify and update the stored images, and create new, without destroying what previously memorized. Thus it differs significantly from the majority of neural networks as neural networks (NN), trained by back propagation, genetic algorithms, in bidirectional associative memory, Hopfield networks, etc. very often a new way of learning, situation or association significantly distorts or even destroys the fruits of prior learning, requiring a change in a significant part of weights of connections or complete ret raining of the network [1-4]. Impossibility of using the specified NN solve the problem of stability-plasticity, that is a problem of perception and memorization of new information without loss or distortion of existing, was one of the main reasons for the development of fundamentally new configurations of neural networks. Examples of such networks are neural networks, derived from the adaptive resonance theory (ART), developed by Carpenter and Grossberg [5, 6]. ART neural network classifies the input image to one of the known classes, if it is sufficiently similar to or resonates with the prototype of this class. After you have found a prototype with some accuracy given by the special parameter similarity corresponds to the input image, it is modified to be more like the presented image. When the input image was not like any of the existing prototypes, then it is based on a new class. This is possible thanks to the fact that the network has a significant number of unallocated redundant or elements which are not used as long as it is not necessary (if no unassigned elements, the input image is not network response). Thus, new images can create new classes, but did not distort the stored information. It is developed a number of neural network based on adaptive resonance theory [7-11]. However, these neural networks have significant disadvantages: NN adaptive learning resonance theory (ART) often leads to degradation, and reproduction classes receive a unique solution, even in those cases where there are two or more possible and equivalent solutions, the results depend on the training images in order training sequence, etc. This requires solving the fundamental problem - the architecture and algorithms to improve the functioning of the ART NN. In particular, it is necessary to develop the theoretical foundations of the ART NN with a new architecture and new learning algorithms. In this paper we consider the most widely used single-module neural network ART-1, proposed to binary input images or vectors. Basic network architecture shown in Fig. 1 in phantom includes three groups of neurons: field F1 input processing neurons, consists of two layers of elements, recognition layer Y- neurons and control neurons R, G1, G2 (Fig. 1). Field F1 consists of two layers – input layer S-elements and the interface layer Z-elements. The input layer receives the image requirements and transmit the information received interface layer neurons and manage neurons R, G1, and G2. Each element ofZi (i= 1, n) interface layer is associated with each element Yj(j=1, m) discriminating layer Y two kinds of weighted connections. Signals from the interface layer to layer Y transferred to a bottom-up connections with weights Wij1, and from discriminating layer to the interface – bonds with weights Wji2(j= 1,m,i=1,n). Due to a large number of bonds in Fig. 1 shows only one pair symbol bonds with weights Wij1,Wji2 between interface and recognizing layers of elements. Most of the connections shown in Fig. 1 are excitatory: from input layer S- elements to neurons R, G1, G2 and Z-layer, from neurons G1, G2 respectively to neurons layers Z and Y. Inhibitory signals are transmitted multiple links from the interface elements to R-neuron and from Y-neurons to element G1. All communications network ART-1 transmit only binary signals 0 or 1. Each element in the interface or Y-layer neural network ART-1 has three input sources. Arbitrary interface elementZi(i= 1, n ) can receive signals from element Si input layer, from elements Y-layer and from neuron G1. Similarly, the element Yj (j = 1, m) can receive signals from the interface elements, neurons R and G2. To translate the interface neurons layers or recognizing neurons layers in the active state, you must have two sources of input single excitation signals. Since each of the neurons is considered three possible signal sources, the condition of excitation of these neurons has been called " rules two of three". - braked (UoutYj=1 and neuron not allowed to compete upon presentation of the current input image). and satisfy condition: 0<U out Y j<2. where Uout - norm of the vector Uout; UoutZ=(UoutZ1,...,UoutZn),UoutS=(UoutS1,...,UoutSn) - vector output signals, respectively Z- and S-layer elements. If the calculated similarity value indicates coincidence with a given accuracy input and stored in the memory image, then the network resonance occurs. In this case on the output R-element will be zero output signal, and will be training weights winning neuron connections. When parameter value is less than the similarities preassigned on the output control R-element single signal appears, which victory Y-neuron braked (Uout.YJ=1) and actually deprived of the opportunity participate in competitions upon presentation of the current image. Then in Y-layer selects the new winning neuron. If the input image was not like none of the stored, then all distributed Y-neurons, eventually, are inhibited, and the winner becomes undistributed Y-element, who remembers in his weights new image. Neural network ART-1 training is usually done using a fast learning algorithm [9, 12]. Wji2 – weight of connection from an element Yj to the element Zi; recommended initial value. Step 1. The first step is initializing parameters L, p and weights Wji1 of connections from an interface layer to a weekend, and connections Wji2 (i = 1, …, n; j = 1, …, m) from a weekend layer to the interface. Step 2. The terms of stop are analyzed, and while they are not executed, steps 3 – 14 of algorithm will be realized. Step 3. For every teaching entrance vector Sk (k = 1, …, q) are executed steps 4 – 13.
if UoutYj1,thenUoutYj=i=1nWij1UoutZi,j = 1, …, m.
Step 8. While not found Y-neuron of output layer, weight vector of which in accordance with the specified value of likeness parameter of р corresponds an entrance vector Sk, are executed steps 9 – 12. If such elements few, gets out an element with the smaller index. If U out YJ=1, then all elements are put on the brakes and entrance image can not be classified or memorized. Step 12. Checked up the condition of teaching possibility of the selected neuron YJ. If UoutZ/Sk<p, that condition is not executed end element YJ is braked, i.e. UoutYJ=1. After it passing carried out to the step 8 of algorithm. If UoutZ/Skp, condition of teaching neuron YJ possibility is executed and progressing to the next step of algorithm. WJi2=UoutZ i, i = 1, …, n.
Step 14. The conditions of stop are checked up. The conditions of stop can be: absence changes of scales net , during an epoch, achievement of the specified number of epochs and so on. During practical calculations revealed deficiencies fast learning algorithm NN ART-1, do not allow to use them effectively in real systems management and recognition, where the original data are noisy. In noisy input image fast training of the neural network algorithm can lead to degradation and reproduction classes, that is, the learning algorithm becomes inoperative. Demonstrate this lack of a specific example of a learning neural network ART-1. Classification mentioned vectors can be performed in many ways. One of the most suggests itself - assigned to the first class of vectorsS1,S2,...,S5, to the second class - vectors S6,S7,...,S10, i.e. to build classes of vectors, differing from each other by not more than two components. These classes of vectors can be viewed as classes, which obtained by the impact of noise of vectorsS1,S6, resulting which in the vectors S2,S3,S4,S5,S7,S8,S9,S10 lost by one unit component. Let's try to get this classification using neural network ART-1. Let us take a network with parameters: m = 8 – number Y-neurons in discriminating network layer; n = 8 – number of neurons in the input layer of the network; р = 0,75 – similarity parameter; selected such numeric values based on the fact, that the vectorsS1,S2,...,S5 ; S6,S7,...,S10, in each class differ from each other by not more than two components, and the parameter of similarity is calculated using only single component vectors; Wij1=1/(1n)=0,111 - initial weights values of connections Wij1(i=1,8;j=1,8); Wji2 = 1 - initial weights values of connections Wji2(j=1,8;i=1,8). During training the neural network obtained the following results. Analyzing example shows, that to determine the number of selected classes of input vectors rather one of the matrices W1, W2 weights of connections, so in the future will only use a matrix of weights connections W1 as a more informative. W1=0 0,500 0,500 0,500 0,111 0,1110,1110,1110,500 0 0,500 0,500 0,111 0,1110,1110,1110,500 0,500 0 0,500 0,111 0,1110,1110,1110,500 0,500 0,500 0 0,111 0,1110,1110,1110 0 0 0 0,111 0,1110,1110,1110 0 0 0 0,111 0,1110,1110,1110 0 0 0 0,111 0,1110,1110,1110 0 0 00,111 0,1110,1110,111. W1=0 0,500 0,500 0,500 0 0 0 00,500 0 0,500 0,500 0 0 0 00,500 0,500 0 0,500 0 0 0 00,500 0,500 0,500 0 0 0 0 00 0 0 0 0 0,500 0,5000,5000 0 0 0 0,500 00,500 0,5000 0 0 0 0,500 0,500 00,5000 0 0 0 0,500 0,5000,5000. Thus, the analysis of the solution shows an example that the network ART-1 during training can not share a set of vectors S1,S2,...,S10 into two classes, because it is reproduction classes. Vectors S1,S6, which could become the reference vectors of the two classes degraded in the process of presenting the following vectors, which leads to duplication of classes. 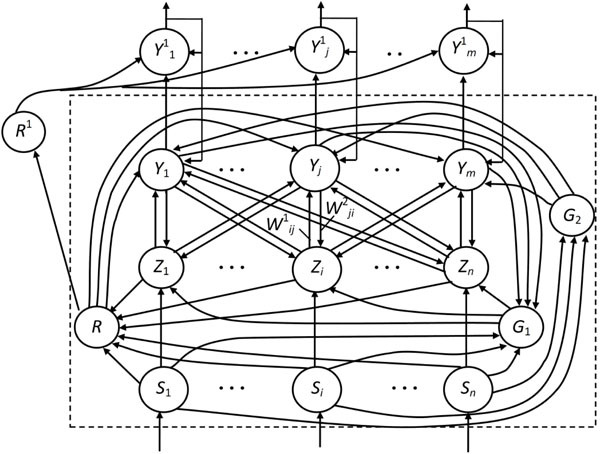 Remembering two vectors S1,S6 results in weight matrices connections W1,W2, with which could correctly classified all of the input image, if after the presentation of input vectors S1,S6 there was no adaptation of neural weights, change it memory. However, remembering association binary vectors without a teacher also has its drawbacks, since can easily appear matrix of weights connections, having in their respective columns (matrix W1) or rows (matrix W2) for distributed Y-neurons minimum number of zero elements or even not having them at all. Therefore, when memorizing the combining binary vectors needed correction the work of algorithm or participating teacher. Examples of successful use at training a neural network crossing or union of the input images indicate to the fact, that, apparently, may be prepared learning images also with using a combination of these operations, as well as using other operations on binary sets. Thus, we can conclude, that adapting the weights of network connections in the form, wherein it is used in a neural network ART-1, is the lack of the network. The disadvantage, as shown by the above example, also may be the lack of teacher. Similar problems also arise in training the continuous NN ART. Thus, the adaptation of weights of distributed recognizing communications Y-neurons net in the form, wherein it is used in the network ART-1, often fails to solve even trivial tasks of classification and training, then there is a significant lack of the network. -	no training mode networks with teacher, that restricts the class solved by neural network problems classification and recognition. To prevent degradation and reproduction classes, that is, for the correct and stable operation of the modules on based of neural network ART-1, proposed ban adaptation weights of connections of distributed recognition neurons. For this, at step 11 learning algorithm adaptation of connections weights of recognizing elements produced only, if these neurons were distributed earlier. Otherwise - weight relationships recognition elements not adapted. With this algorithm, the set of training M vectors, if they are served in the order, wherein they recorded in the set, is divided into two classes - to the first class relate vectors S1,S2,...,S5, to the second class - vectors S6,S7,...,S10 that is, it turns out the most natural classification vectors. However, if the order of training vectors changes, for example, vectors S1,S6 in their subsets not subject to the net first, then changed also classification of the vectors. General lack of different systems classification using a variety of neural networks or other approaches or methods consists in, that it turns out only one classification, due to the method of teaching or raised by teachers. At the same time, when there N various objects, it is possible to obtain 2N. Polar cases of these classifications: one class contains all the objects; each of the N classes contains one object. At N = 10 number of possible ways of classifying exceeds 1000. Therefore require different approaches to select the best classification. One of these approaches may be specifying the number of classes or minimization, or maximizing the number of classes under certain restrictions. Introduction such restrictions necessary, because otherwise while minimizing the number of classes will be obtained a single class, and while maximizing the number of classes is obtained N classes. One such limitation can act parameter of similarity images. When parameter similarity, equal to unity, it is obtained N classes, when parameter similarity, equal or near to zero − one class. As a second constraint can act the presence or absence of ability to adapt weights of connections distributed recognition neurons. The learning algorithm of neural networks ART-1 the sequence of images, ordered by increasing values of their norm, wherein, the first to network are presented images with minimal norm. Applies in cases, when it is desired to obtain an increased number of classes of images. The learning algorithm of neural networks ART-1 the sequence of images, ranked by descending value of their norms, wherein, the first to network are presented images with the maximum norm. Applies in cases, when it is desired to obtain minimum number of image classes. The learning algorithm NN ART-1 the sequence of images, ranked by teacher, wherein in the training sequence can be used subsequence as with increasing, as with decreasing norm of the input images. The learning algorithm discrete neural network ART, in which the initial values of weights connections are given by teacher, using complex input images, which are derived from initial using Boolean operations "AND", "OR", "NOT", other mathematical operations, heuristics or combinations thereof forming methods of training images. 2. The learning algorithm, using a joint application of the algorithm rapid learning NN and learning algorithms without adaptation of network weights upon the occurrence of resonance. An example of such algorithm can serve an algorithm, wherein in the first stage (first epoch) used the fast algorithm of neural network ART-1 learning, and at later epochs used learning algorithms without adaptation weights of connections recognizing distributed neurons of network upon the occurrence of resonance. A general lack systems of recognition and classification based on neural networks, including networks ART - obtain a unique solution, even in cases, when there are two or more possible and equivalent solutions. In recognition of such images recognition result may depend on the order of filing in the training mode reference pictures, given by teacher. Show it on the example. Example 2. Recognition image, located on the borders of several classes. Take ART-1 network with parameters: m = 5 – number Y-neurons in discriminating network layer; n = 12 – number of neurons in the input layer of the network; р = 0,5 – similarity parameter images. Let the teacher used as reference the following three vectors: S1=(1,1, 1, 1, 0, 0, 0, 0, 0, 0, 0, 0),S2=(0,0, 0, 0, 0, 0, 0, 0, 1, 1, 1, 1),S3=(0,0, 0, 0, 1, 1, 1, 1, 0, 0, 0, 0), who served in the training mode in the following order: S1,S2,S3. When the input of the neural network considered recognition mode vector S=(0,0, 1, 1, 1, 1, 0, 0, 0, 0, 0, 0) then it will be assigned to the first class, that is, a single output signal will be on the output of recognizing neuron Y1, because this neuron has a minimum index. If chosen neuron with maximal index, then the winner neuron became neuron Y2. A similar situation arises when applied to the input neural network vector S=(0,0, 0, 0, 0, 0, 1, 1, 1, 1, 0, 0), which will be assigned to the second class because training image S2 was filed before the image S3. To exit from this situation necessary to use a neural network ART, which ability to define multiple solutions (Fig. 1). To extend the capabilities of discrete neural network ART-1 and get all the possible solutions of the problem of recognition to the basic architecture of ART-1 added another control neuron R1, the inverting outputs of the neuron R, and a recording neurons layer Yj1(j=1,m). Each neuron Yj1 associated with binary unidirectional communication with the corresponding neuron Yj. Before recognition mode neurons Yj1(j=1,m) translated into a passive state ties on the circuits, not shown in Fig. (1). Neurons Yj1(j=1,m) , go to the active state by the rule "two out of three" - in the presence of single neurons of the output signals Yj and control neuron R1. The unit output signal of the neuron Yj1 through a feedback circuit fixes its unit output and inhibits neuron-winner Yj. After that, the network begins searching for a new neuron-winner. The search process continues until, until all recognizing distributed neurons not will inhibited. In this case on the outputs of neurons Y1 may not be no unit signal, since the input image not similar to any of the images, stored in the weights of network connections, or on outputs of Y1 -neurons may be one or more unit signal, respectively indicating belonging the input image to one or several classes of images. Thus, it is developed a new architecture of discrete neural network adaptive resonance theory, which allows to specify one, two and an increasing number of decisions (if they exist) in pattern recognition and classification of black-and-white images. Proposed new learning algorithms of discrete neural networks ART, prevent degradation and reproduction classes at training networks with noisy input data. Overcome one of the drawbacks common classification systems based on neural networks, consists in the fact that it turns out only one classification, due to the method of teaching or raised by teacher. Proposed learning algorithms of discrete neural networks ART, allowing to obtain a variety of methods classifying input data. Suzuki K. Artificial neural networks Architectures and applications. Publisher In Tech 2013; p: 256. Bianchini M, Ed. Handbook on neural information processing . Springer: (Intelligent Systems Reference Library) 2013; p. 499. Huajin T, Kay CT, Zhang Y, Eds. Neural Networks Computational models and applications. Publisher Sprnger 2007; p. 322. Zadeh L, Ed. Neural networks theory. Publisher Sprnger 2007; p. 421. Grossberg SA. Competitive learning from interactive activation to adaptive resonance. Cognitive Sci 1987; 11: 23-63. Carperter GA, Grossberg SA. Massively parallel architecture for self-organizing neural pattern recognition machine. Compu Vis Graph Image Process 1987; 37: 54 -115. Leonov S Yu, Dmitrienko VD, Gladkikh TV. K-value adaptive resonance theory of the neural network for analyzing the operability of computing devices. World App Sci J 2014; 30(12): 1932-8. Bodjanskij EV, Rudenko OG. Iskusstvennye nejronnye seti arhitektury, obuchenie, primenenija. -Har'kov TELETEH 2004; 372. Quek C, Tung WL. A novel approach to the derivation of fuzzy membership functions using the FalconMART architecture. Pattern Recognit Lett 2001; (22): 941-58. Fausett L. Fundamentals of Neural Networks Architectures, Algorithms and Applications. -New Jersey Prentice Hall Int Inc 1994; 461.